The deadliest catch is getting a lot less deadly. Last week, the U.S. Coast Guard reported to the North Pacific Fishery Management Council that for the first time in known history, no one died on the job while commercial fishing in Alaska during the last federal fiscal year, which ended Sept. 30. “This is the first year, going back as far as we have records, that we didn’t have what I’ll characterize as an operational-related death,” said Coast Guard Capt. Phillip Thorne, chief of enforcement for the Coast Guard in Alaska. The Coast Guard’s “operational death” category includes deaths that happen in the act of fishing, but it doesn’t include the deaths of fishermen that happen while a boat isn’t actively working. In most years, that distinction wouldn’t matter. Commercial fishing was for years the deadliest industry in Alaska and the United States, and changing the measuring stick couldn’t change that. It’s one of the reasons the TV series “Deadliest Catch,” which just completed its 11th season following crab fishermen in the Bering Sea, earned its name. Today, salmon fishing — not Bering Sea crabbing — is Alaska’s deadliest catch, and commercial fishing nationwide — and especially commercial fishing in Alaska — is getting safer. In 2005, the year “Deadliest Catch” premiered, 15 people died in Alaska’s fisheries, most when their boats sank. Last year, according to NIOSH figures, just nine people died in Alaska fishing accidents, and the 29 deaths nationwide were the lowest since NIOSH started keeping records in 2000. During the period of the Coast Guard’s claim, NIOSH recorded only a handful of deaths in Alaska. Those include a man who washed up in Kodiak’s harbor, a possible fall overboard in Seldovia, a suicide aboard a fishing boat, and what was either another suicide or a drug overdose. All those cases are still being investigated. “They’re not the kind of events we typically associate with fishing accidents,” Lincoln said. The first definitively fishing-related death took place Sunday when a Kodiak diver was killed while harvesting sea cucumbers in a commercial fishery. Those incidents aside, Alaska’s fisheries are getting safer, Lincoln and Thorne said. “In the United States, the number of fatalities are decreasing; there is a decreasing trend,” Lincoln said. The number of fishermen is declining, which is likely a factor. Many fisheries have been rationalized and consolidated, with quotas in place for individual fishermen instead of an entire fleet. Instead of having boats race out to catch the most fish before the fleet hits its quota, fishing is slower. 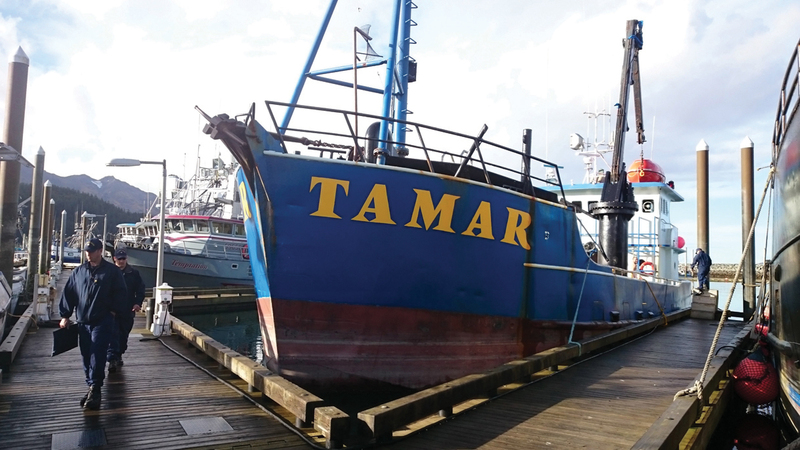 “It’s allowed fishing vessels to be empowered to make very good decisions about the weather and their operations … and that’s resulted in a safer fleet,” Thorne said. New equipment — winch shutoffs, more comfortable life jackets and better training through groups like the Alaska Marine Safety Education Association — also helps. The Coast Guard has also increasingly emphasized safety exams and on Thursday began mandating them nationwide for every fishing vessel that works more than 3 miles offshore. With more federal fisheries observers required aboard Alaska fishing boats, “we have had a lot of outside drivers that have made our phone ring, and it’s just been fantastic,” said Scott Wilwert, the Coast Guard’s commercial fishing vessel safety program manager in Alaska. Wilwert said about 1,500 boats in Alaska will need an exam, and about 400 still need to get one. There’s also simple chance. While six commercial fishing boats sank between June and September this year, no one was killed. In the past, vessel sinkings have been either the biggest or one of the biggest drivers of fishing fatalities.